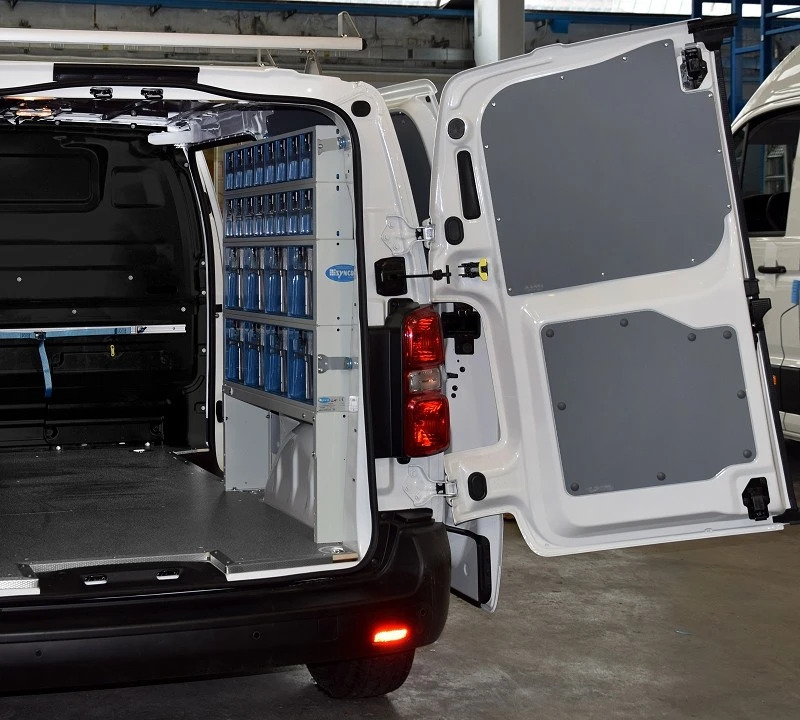 The tradesman who specialises in the installation, repair and renovation of central heating and plumbing systems simply cannot function without a van. The plumber’s van not only transports all the materials and equipment he needs but also serves as a mobile workshop for minor jobs. But how tools, spare parts, sundries and accessories are carried on board makes a very big difference. 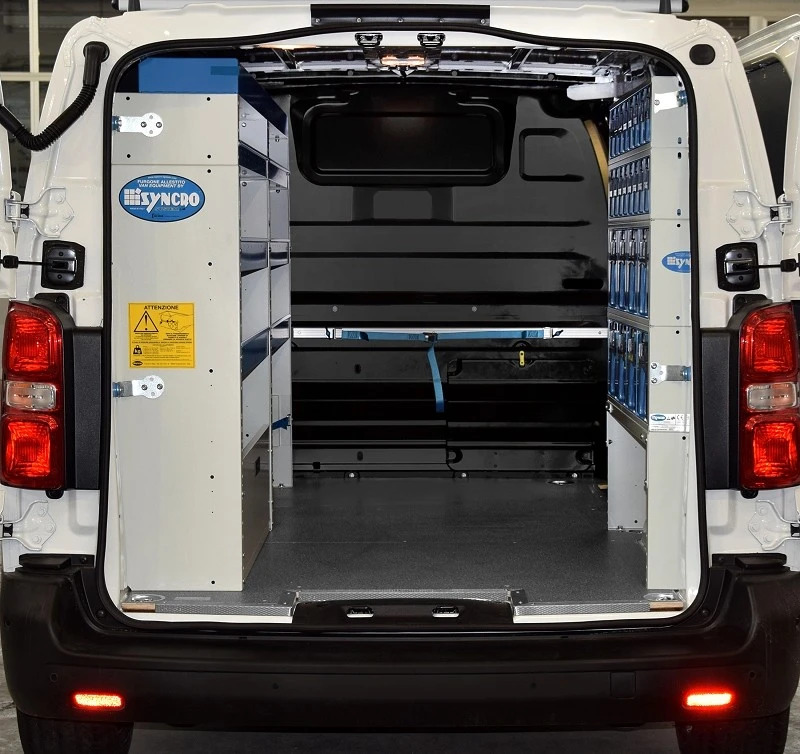 The result of installing a customised Syncro racking system can be summed up in just two words. Tidiness and efficiency. 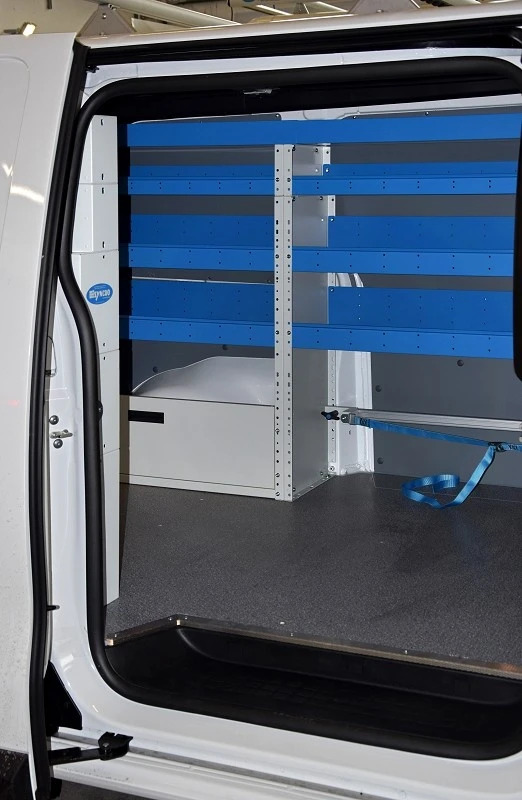 Thanks to the functional and modular design of Syncro racking, storage modules can be combined to carry everything the plumber needs in perfect order, allowing items to be found instantly when needed and put back exactly where they belong at the end of a job. 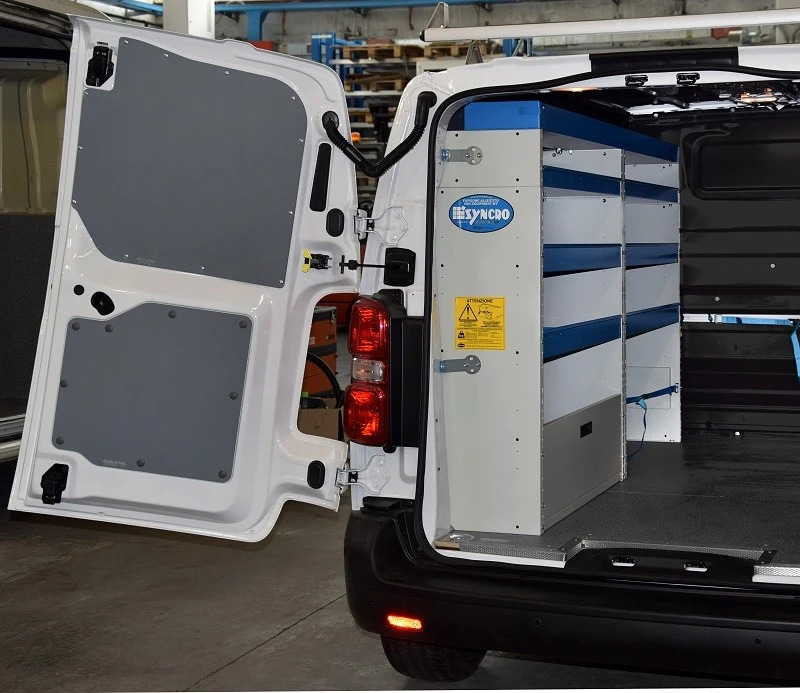 Let’s take a look at a Syncro racking system in a Peugeot Expert. Shelving is often a key component in custom racking systems for plumbers. These photos show how the left side of this Expert has been taken up almost entirely by shelves. Two out of the three columns of racking in this van are shelving. Each shelf is fitted with a non-slip mat to stop contents sliding around. Shelf space can also be arranged into compartments using dedicated dividers, shaped to match the profile of the shelf, which is higher at the back and lower at the front. Dividers are held in place by special clips inserted in pre-drilled holes in the walls of the shelf. The topmost shelf is a specially designed tray that runs the full length of the racking and is accessed from a door at the rear. This type of shelf is ideal for carrying long objects like pipes and cable channels. The Expert’s right side wall is occupied entirely by transparent containers. Apart from metal drawers on ball-bearing runners, Syncro System also supplies two types and various sizes of clear plastic containers. 3. an end to untidy heaps on the floor! And that’s not all. Syncro’s transparent containers are made from PMMA, an amazingly strong plastic that does not become brittle, turn yellow or lose its shape in time. Secure storage with only positive benefits! Syncro System has fitted the roof of this plumber’s Expert with multi-purpose roof bars featuring the exclusive Ultrasilent profile. Ultrasilent profiles – available only from Syncro – are fitted under front cross-bars to prevent the formation of turbulence (in technical language ‘Von Karman streets’). This dramatically improves aerodynamic efficiency and significantly reduces the noise and vibration caused by the roof rack when the vehicle is moving at speed. Syncro System also supplies an impressive range of accessories to complement custom racking. 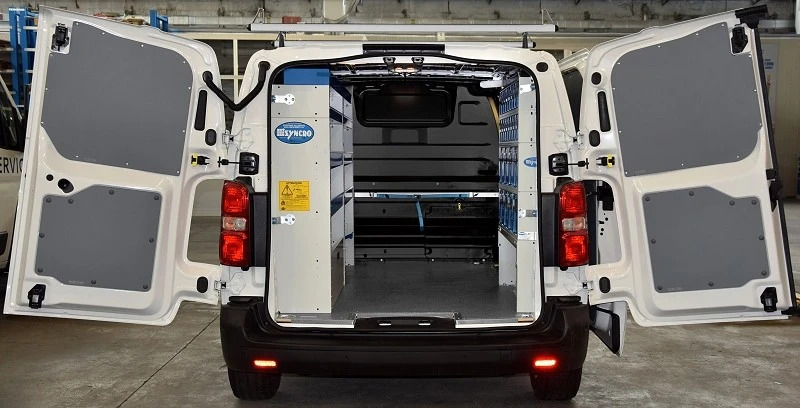 This particular van has been fitted with two bar and strap cargo retaining systems, one on the left side at floor level, used to secure tool cases, and the second at the bulkhead, intended to strap in equipment and materials of all kinds.